This small painting of one rose and two tulips is an exploration of the issue in painting of size vs. scale. The painting is only about 5″ x 14″, a small size, but the rose is huge in scale compared to the tulips. The rose crowds the space, barely fitting onto the paper. 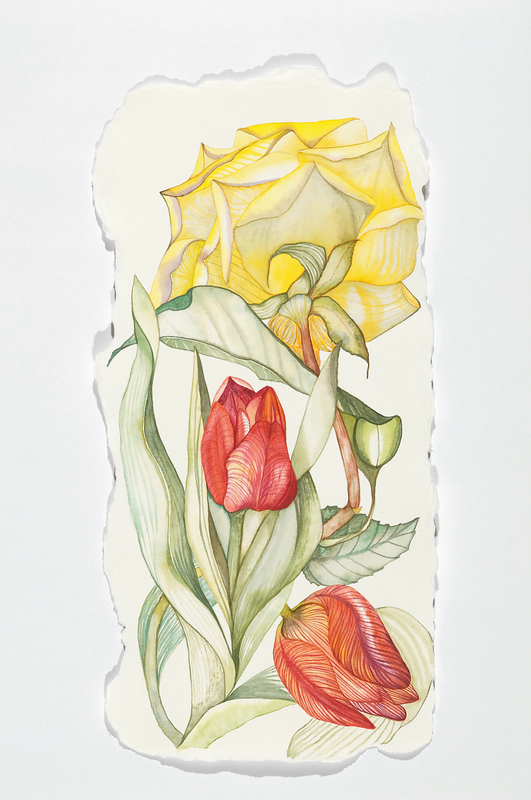 The tulips are more polite and well-mannered, shown at a size you might expect on a little painting like this. Still, the tulips have a lot of presence, with bright color, and detail in the lines that move down each petal. The use of red and yellow as the predominant colors of the painting is also unusual, more assertive than you usually see in a watercolor. That tells more about the impact of the painting–strong and aggressive in the representation of flowers that are more often depicted as soft and pastel-like. You are currently viewing the archives for January, 2014 at Marcia Mitchell.